PHOENIX – Closer Addison Reed was the slowest relief pitcher on the Arizona Diamondbacks last season, but even he is in favor of speeding up the game. Replays, routines at the plate and some really long commercial breaks: There are a myriad of reasons why Major League Baseball games took 40 minutes longer last year than in 1972. But relief pitchers in the modern game are one of the biggest culprits for longer games, and one reason MLB implemented pace of play rules this season. Last season, relievers averaged two seconds longer between pitches compared to their starting counterparts. Although relievers threw only 33 percent of available innings, they averaged more pitches per inning than starters. Many relievers slow down their pace to compensate for the stress and pressure at the end of the game. That’s why many relievers are opposed to the implementation of a pitching clock, which Major League Baseball tested during the Arizona Fall League last season and is currently being used at Triple-A and Double-A. The clock gives pitchers 20 seconds to start their delivery after receiving the ball, and unsurprisingly, major league relievers had a number of complaints about the clock’s possible implementation. One of the slowest relief pitchers in the majors last year was Mariners right-hander Yoervis Medina, who averaged 28.8 seconds between pitches, according to Fangraphs.com. Even though Medina’s routine would be sped up with the implementation of a pitching clock, the young pitcher said he would not be affected. Wooten was quick to point out relievers are not the only players who want to slow the game down in the later innings. 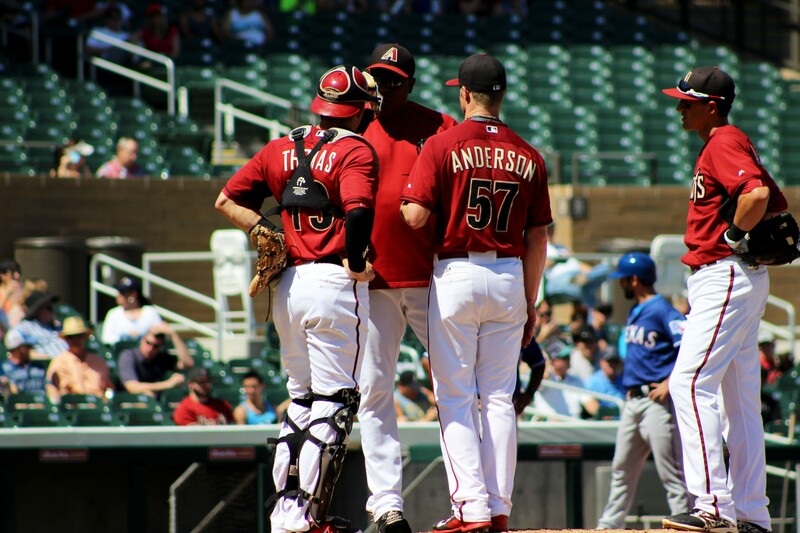 For teams like the Arizona Diamondbacks, implementing a pitching clock would actually reinforce their pitching philosophy. Under new pitching coach Mike Harkey, D-backs pitchers are instructed to throw at a quicker pace to improve the teams’ overall defense. Thanks to the new philosophy, D-backs relievers improved their average pace from ninth to second in the National League last season, according to Fangraphs.com. An increase in the number of pitching changes has also caused many games to come to a grinding halt in the later innings. In 1970, relievers made 5,552 appearances, but that number almost tripled in 2014 to 14,459. The new pitching-change clock should help with this problem. Relievers now have 2:25 to warm up on the main mound, and 2:45 if the game is nationally televised. The results through April 20 suggest relievers are speeding up their pace on the mound this season. Relievers are averaging one second less between pitches compared to 2014. Seattle Mariners reliever Tom Wilhelmsen put the rule changes into perspective. 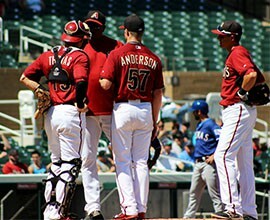 Arizona Diamondbacks pitching coach Mike Harkey instructs a D-backs pitcher during spring training.